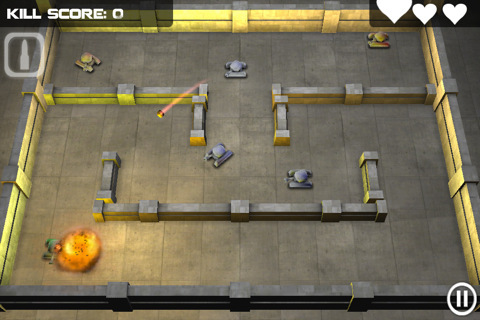 Tank Hero is a 3D top-down tank game with efficiency over rapid-fire gameplay. Released by Clapfoot Inc., Tank Hero is available for $0.99 with a Lite alternative on the iPhone 3GS, iPhone 4, iPod Touch 3rd and 4th gen, and iPad. This app is based on the iPhone 3GS version. Take control of your tank, destroy the enemy with the minimum amount of attack shots, and avoid being destroyed by explosions and ricocheting bullets. 80 levels, 3 game modes, 5 different weapons to obtain, 5 different types of enemies, and 3 control schemes, Tank Hero is definitely a strong game app. So gameplay boils down to controlling your tank and firing at enemies. Where the challenge ramps up is by how the enemy can destroy you. Bullets bounce off walls once and can come up from behind; special enemies can attack over walls and deal area damage. You have to navigate around walls and through narrow paths that put you in incredibly vulnerable positions. Controls can be customized such as dual control sticks or one hand for control and the other for pointing at where to attack. I personally prefer to place the control stick on the left and use my right finger to tap where I want to attack. 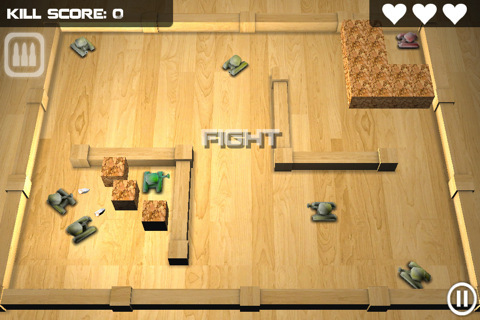 Graphically, Tank Hero has a very simplistic appearance but the 3D really does help put some dramatics into the app. Lighting effects and explosions look pretty good but the backgrounds are generally wooden and bland. Tanks have a very simple design and are easy to read and the enemy tanks are basically the same with color changes. This graphical style would definitely lend itself well to alternate skins besides this ‘wooden toy’ style they have right now. I would love a detailed war zone like a city or maybe a cybernetic, futuristic world. The main goal per level is to get a gold medal for each mission. Usually, this is accomplished though making every shot you make count. A lower accuracy rating lowers your score and getting hit by enemy fire can drop you to bronze in just two hits. Some levels are specifically designed to have multiple hallways that don’t allow for dodging, so careful navigation and fast timing are required. It’s tough but ultimately rewarding when you get the gold medal for a good job. Overall, I was impressed by the level structure and teaching progression. Tank Hero has great potential for new skins, but the toy look has a definite child-like feeling that might explain its popularity in other countries. Check this app out for yourself through its Lite alternative and see how many gold medals you can get! AppSafari review of Tank Hero was written by Joseph Ho on June 20th, 2011 and categorized under Action, App Store, Arcade, Games, Strategy. Page viewed 4306 times, 1 so far today. Need help on using these apps? Please read the Help Page.